Their glove is pointed straight at the target, with the arm a little above their head. The right leg comes in, not closing too early. And she’s going to pull her glove down. You’re going to hear a slapping noise, and she’s going to go ahead and follow through. But she’s only doing half of her pitch at this point. At this point, you can break this down into two different things: She could use just her arms or you can add in the legs and work on dragging through it. As she gets better at this, she can even add a little step to get more rhythm. Important Points to Remember: Be sure to work on how hard you drive the right leg into the left leg. This is going to help keep the shoulders back and get the body behind the ball when it’s thrown. If your athletes don’t drive their right leg up fast enough and you see a lot of leaning forward during the pitch. So instead of saying don’t lean forward, we want to really impress thinking about driving the right leg as fast as you can into the left leg. It’s a fast drag and it’s quick. And now she’ll be getting maximum power because she’s driving everything behind the ball when she throws. 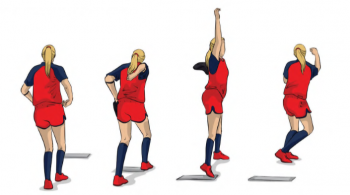 Looking for more awesome softball pitching drills and tips? Then be sure to check out Championship Coach Sue Enquist’s other Softball Coaching Videos! Sue will share some great tips and softball pitching mechanics, hitting and much more! And don’t forget to Like Us on Facebook, where we share more great drills, tips and suggestions.